February’s Teen Science Café featured Dr. Emily Hall talking about ocean acidification, the threat it poses to our oceans today and in the future, her research, and ways we could help. Once a Mote intern from Sarasota, Emily received her PhD and is now manager of Mote’s Ocean Acidification Program. She began her presentation by explaining that ocean acidification is the term used to describe the ocean’s pH dropping (becoming more acidic). The burning of fossil fuels releases carbon dioxide into the atmosphere, and some of that CO2 precipitates down into the ocean. The CO2 bonds with the H2O forming H2CO3 – Carbonic acid. It then ionizes releasing positively charged hydrogen ions which make the water more acidic. The increased acidity harms organisms with calcium carbonate shells or skeletons, such as coral and conch, by slowly dissolving their shells. Emily is currently researching the reaction of corals to ocean acidification and if they react differently around seagrass. Seagrasses absorb carbon dioxide to photosynthesize and release oxygen which is something that may alleviate OA (Ocean Acidification) on coral. Her research also investigates how oysters and scallops in and around Sarasota Bay will react to the oceans of the probable future. She has even done field surveys in Italy in a bay next to a volcano where the water is naturally acidic and in and the underwater blue holes off of the west Florida coast. Emily used an analogy of a student to explain to us how we could help reduce ocean acidification. A student who is stressed, eating junk food and not exercising is more likely to catch a flu than one who eating healthy and staying fit. Marine organisms cannot cope with ocean acidification as well if they are dealing with pollution, increased temperatures, and many other stressors at the same time. Reducing pollution in the water by doing clean-ups and reducing fossil fuels burned by cars by biking or carpooling instead can have a positive effect on organisms experiencing ocean acidification. After her presentation, Emily showed us how we could change the pH of a cup of water by blowing in it and how much of an effect that increased acidity has on a piece of calcium carbonate. Emily’s enlightening presentation gave us a better understanding of one of the biggest threats facing our oceans today. 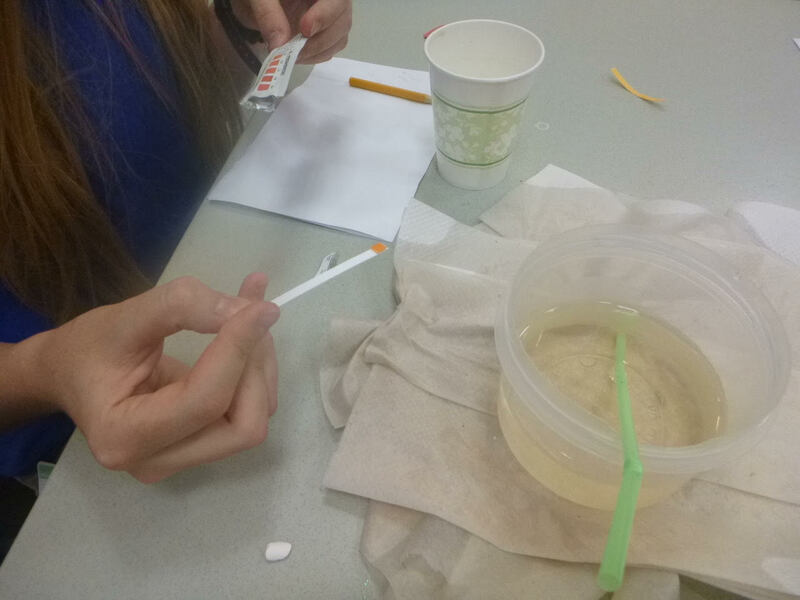 Blog written by Mote High School Intern Jack K.
Cups of water with pH indicator and straws. 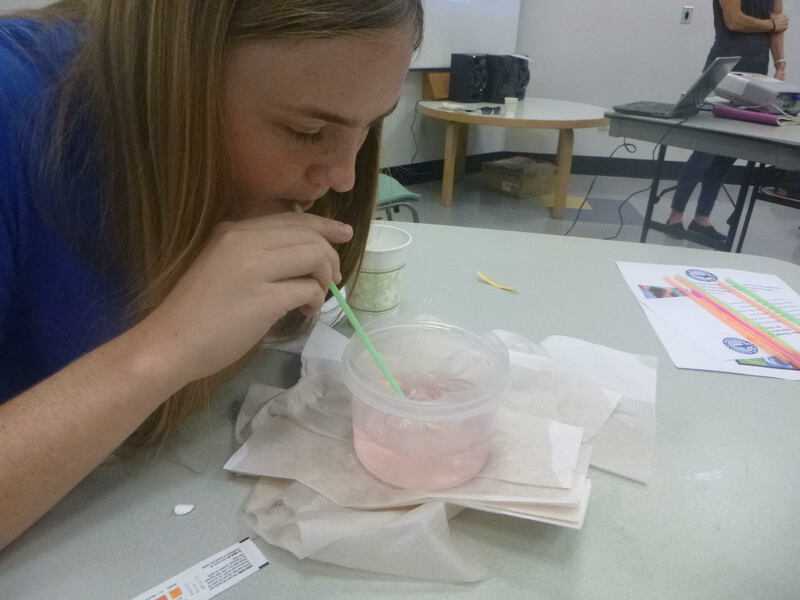 Students exhaled into the cups of water using straws to see the shift in color. pH of each cup was tested before and and after exhalation. Small pieces of chalk were then put into the higher pH water and the students could watch it dissolve, correlating with ocean acidification and the impacts on corals and other shelled creatures.